Cars are slowly but surely merging, technologically speaking, with the smartphone in our pocket. Functionality is often repeated, from cellular connectivity to Spotify integration, and some infotainment touchscreens even show versions of the same software that runs on our phones. The car and the smartphone are becoming one. The relationship between car brands and smartphone makers is a long one, but before in-car tech caught up with mobile tech, the two worked together in a different way — by co-branding products. What have the results been like? Well, for the most part, we’re going to it’s a checkered past. Don’t believe us? Settle down while we explain. The first name on our list perfectly encapsulates how car brands getting involved with smartphones can go well, and badly. 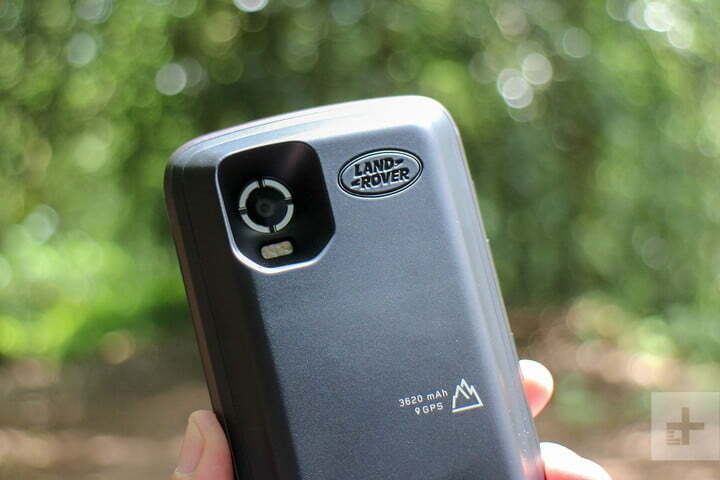 Early on, the Land Rover name was used on rugged phones like the S1. They were phones for the Land Rover Defender owner, who needed a phone that still worked after it had fallen out of the cab into the mud, been run over, forgotten, and recovered a week later. These weren’t Land Rover phones, they were phones with the Land Rover name on them. Not so for the Land Rover Explore, a 2018 Android smartphone that was made for the modern Land Rover Discovery, Range Rover, or Evoque owner, not Farmer Giles in his Defender. Relevant features, a design with influence from the cars, and an actual reason to buy it — the Land Rover Explore is the way car brand collaborations should be. Instantly recognizable around the world, whether it’s on the back of a car or the front of a t-shirt, the addition of a Prancing Horse onto a non-car product means one thing — it’ll be expensive, and of questionable taste. A fine fit for a luxury smartphone then. Except every time Ferrari has put its name on a phone, everything has gone wrong. There have been quite a few Ferrari-branded phones, but we’re going to single out two. Vertu has made a few Ferrari-branded phones, with the most memorable being a special edition of the Vertu Ti, its first Android phone. The Ferrari edition aimed to take the sleek looks of the F12 Berlinetta and blend them with the Vertu Ti, which was a big bruiser of a smartphone. Leather used in the car covered the device’s back, while a diamond-like coating (DLC) was added to the titanium body, and carbon fiber covered the pillow and physical keys. Naturally, there are various horses and Ferrari logos, and it cost around $6,500. Too much? Motorola repurposed a phone called the i867 in 2012, and had the gall to say it was “inspired by the Ferrari 458,” despite looking like a pig’s behind. It was red (of course), had some carbon fiber effects, some Ferrari wallpapers, and came with a Ferrari key ring. At least the Vertu Ti Ferrari Edition was expensive, to go with your expensive car. The Motorola i867 was a nasty wart of a phone to go with your Proton Impian. 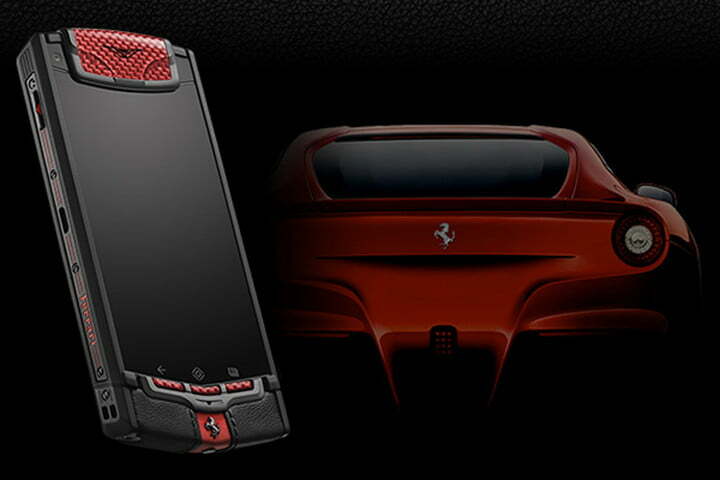 Ferrari has also embarrassed itself with an Acer phone, the Liquid E Ferrari Special Edition. The mobile phones made by Tonino Lamborghini, a luxury lifestyle brand started by the heir to the Lamborghini name, don’t count here for reasons we will explain later. 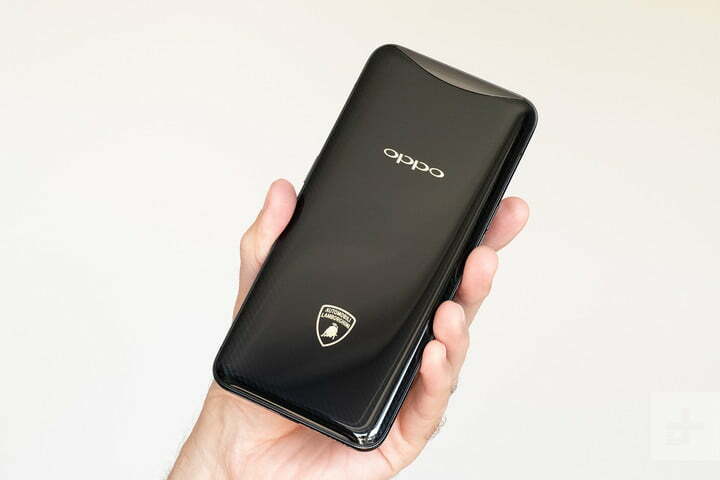 What does count is the Oppo Find X Lamborghini Edition. Launched with the innovative Find X, the Lamborghini Edition comes in a flashy box with some Lambo-branded true wireless headphones, and a version of the Find X with Oppo’s ultra-fast Super VOOC charging system. Just 35 minutes is all it takes to charge the battery, which at least connects the Lamborghini brand to the phone, despite it not actually being involved outside of lending its name. Are we disappointed? No, because there’s an actual reason to buy the Lamborghini Edition over the regular Find X, if you can stomach the higher price. A decent example of a partnership. Vertu exorcised its Ferrari demons when it launched the Vertu for Bentley, based on the Signature Touch, in 2015. The phone was made for Bentley owners, and came with an app that remotely controlled aspects of the car, so everything from the climate control to the seat position, and even the window blinds could be adjusted from your phone. 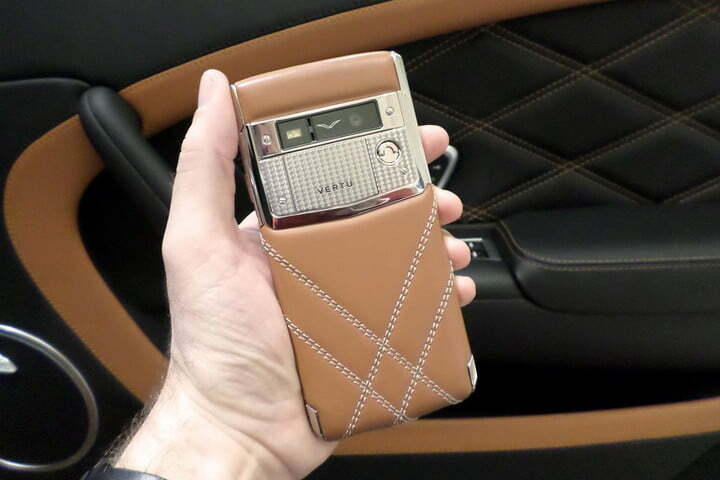 More helpful for anyone traveling in the back of a Bentley than the front, we loved that the leather on the phone could match the leather in your car, very much in keeping with the bespoke nature of owning a Bentley. Vertu is no more, and Bentley hasn’t partnered with another car brand since. It’s rather a shame, as there is obviously some understanding of what makes a decent collaboration here. The bottom of the car-branded phone barrel is 10-feet deep in lazy, electronic tat that makes as much sense as a commemorative plate featuring both the cast of The Great British Bake Off, and ExxonMobil’s board of directors. What do we find when we rummage through? A Motorola International 8700 with Jaguar branding, which was included with your brand-new Jaguar bought in 1996, along with less flashy Motorola analog phones that came with Ford cars of the same era. There’s even a Hummer phone, which has nothing to do with Hummer cars aside from the name. Mostly products of their time, in that extensive co-branding projects were a rarity when these devices were made, these are no worse (and no better) than branded phones from designers including D&G, Armani, and even Billabong. However, they serve as warnings to companies considering partnerships today. We don’t like these. Please try harder. Bet you’ve scanned this and seen Porsche Design hasn’t been mentioned, and are about to knock out a derogatory tweet, right? Before you do, there’s a reason Porsche Design isn’t here. It’s because Porsche Design doesn’t make cars. It’s a design house that happens to have been started by Dr. Ferdinand Porsche, who absolutely knows a thing or two about wonderful sports cars. But they aren’t the same thing. Yes, Porsche Design has put its name on phones from BlackBerry, Huawei, and even Sagem in the past, but the closest thing to a car it has put its name on is an Austrian train, and that’s not close enough to be featured here. Tonino Lamborghini, an Italian design house that’s not Lamborghini Automobili, also made many phones that don’t qualify for exactly the same reason. From the recent Alpha One to the Tauri 88, these aren’t Lamborghini phones, they are affronts against all those with eyes. And taste. Not all the phones mentioned above are shameless cash-grabs, aimed at convincing fans of luxury cars they should pay too much money for rebadged mobile phones. No, some are worse. However, excitingly, OnePlus has the chance to change all that with its partnership with McLaren. It’s a potential winner. OnePlus has a history of making great collaboration phones — from Star Wars phones to one with artist Jean-Charles de Castelbajac — and McLaren protects its strong brand with practically religious aplomb. Details are coming on December 11. Will we get a McLaren OnePlus 6T? Or a big bowl of disappointment? We’ll update this article when we know more, but we’re ready for history to be changed. Published on Sat, 08 Dec 2018 09:00:59 GMT, © All rights reserved by the publisher.